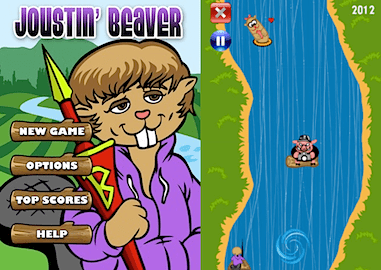 The parody app portrays a beaver floating on a log down a river. 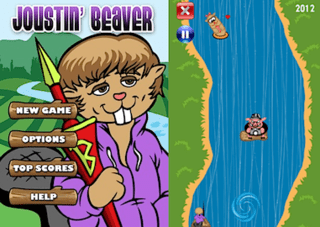 The beaver presents with bangs, a lance, and a purple sweater. The beaver knocks 'Phot-Hogs' that are attempting to take his photograph into the river with his lance. The beaver also signs 'Otter-graphs.' The beaver also must dodge the 'whirlpool of success,' which will lead beaver out of control, while navigating the river." Well, that's horrible on many levels, but the company's first problem is jurisdiction. Bieber lives in California, and while as the company alleged he does perform in Florida and have various business contacts there, none of that has anything to do with the controversy over the app. And for that reason, as the Hollywood Reporter noted yesterday, the federal judge who had been saddled with this case tossed it on jurisdictional grounds. The case was dismissed without prejudice, so the company could refile somewhere else, or (more likely) Bieber could file anywhere there is jurisdiction over the company. Since it appears there will probably be a round two, let's wait until then to consider the First Amendment issues raised here. I may argue at that point that "otter-graphs" is so bad that it is the equivalent of "fighting words" not entitled to protection, but let's see what the lawsuit looks like first.